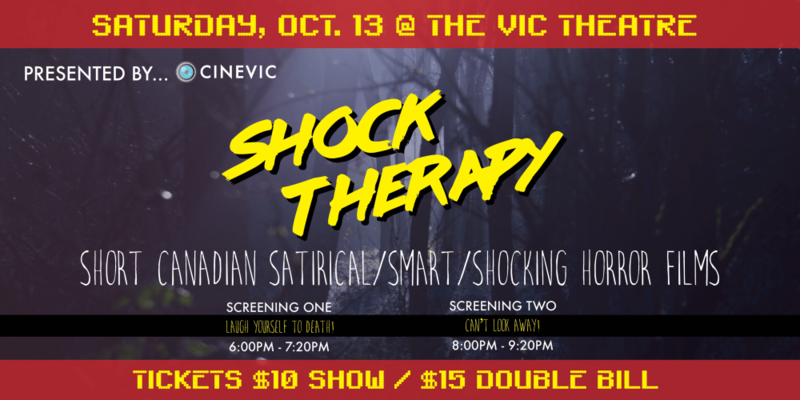 Join your friends from CineVic on Saturday, October the 13th, as we debut our brand-new horror film event, Shock Therapy! Shock Therapy: Short Canadian Horror Films is the upcoming short Canadian horror event presented by CineVic Society of Independent Filmmakers. In its premiere year, Shock Therapy will be illuminating the best of Canadian short horror films, with a focus on the creative, satirical, and psychological. Shock Therapy will have two screenings. Screening One will showcase a variety of “horror-lite” shorts, ranging from comedic to bizarre and beautiful, and back again! Screening Two features a collection of gritty, shocking, and eye-opening shorts. The one thing that these shorts all have in common is conflict with monsters — both real and psychological. The full line-up is available at CineVic.ca. Advance tickets are available through Eventbrite, at $10 a screening or $15 for a double bill. This screening will feature comedies as well as creative and “horror-lite” themed shorts in order to showcase the genre to a new audience (although we think fans of “traditional” horror will also enjoy these!). This screening will feature darker, more “mature” shorts. Click here for the full line-up!